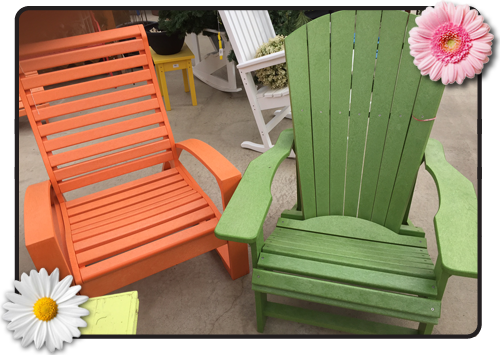 We strive to bring you everything you need to make your indoor and outdoor spaces all your own. 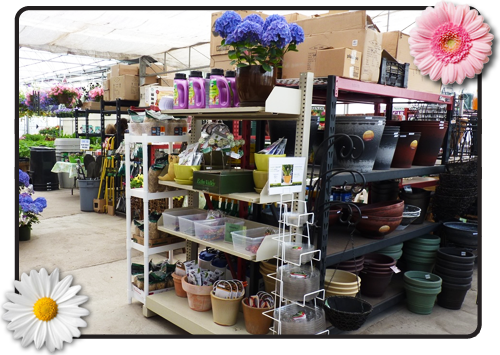 Come in and check out the vast selection of trees, shrubs, annuals, perennials, tropicals, supplies, decorations, water gardens, and seasonal items we have in stock! Whether for privacy or shade, trees are an integral part of any landscape. 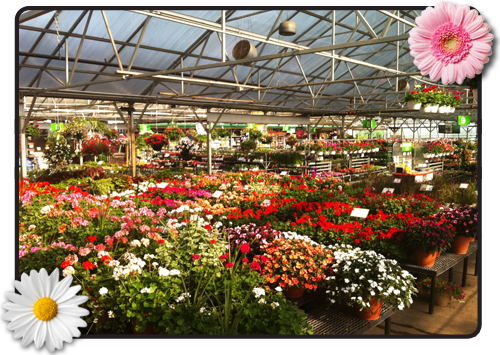 We offer a wide variety of trees, shrubs and roses and can guide you in your selection process. We carry towering aspens, fruit trees, maydays and evergreens, to name a few. We can also make suggestions from wide varietyof shrubs. Lilacs, Hydrangeas and Winged Burning Bush are upright, rounded shrubs with dark green foliage. Fireball Burning Bush features tight branching and superior hardiness, with no winter damage and outstanding red fall colour. Roses provide beautiful color as well. 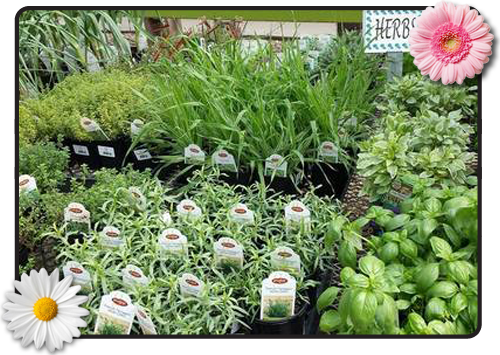 Blondie's has a vast assortment of annual plants, and we grow them here to assure quality and availability. Our selection of traditional favourites and unique introductions makes it easier than ever to make up your planters and flower beds for the season. 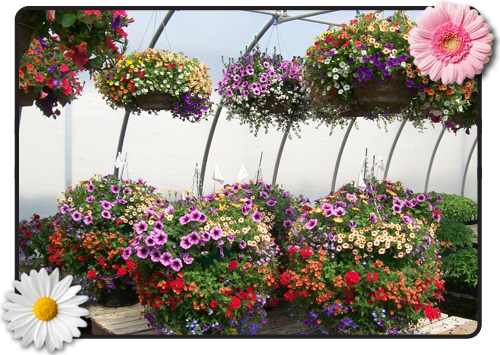 We also have a wide variety of hanging baskets ready for your deck or patio. Not sure what to fill your planters with? We will be happy to share our advice, or better yet bring them in and we will plant them for you! We carry three types of tropicals - foliage, flowering and exotic. Did you know that foliage plants can clean and purify the air, while adding warmth and colour in your home? 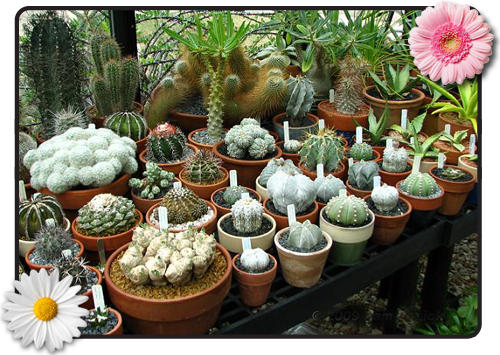 We will help you choose the right tropical for you and provide all the care tips you will need. 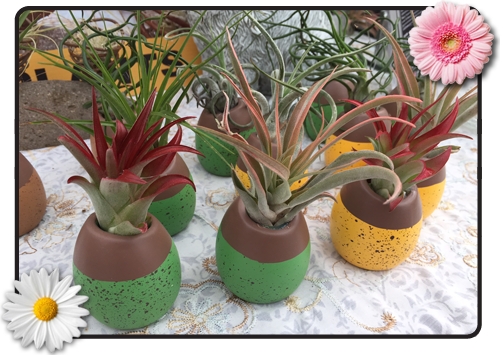 The cacti and succulents is very trendy and in big demand at the garden center.they are very easy to care for and look after,you can make cute little dishes,mini gardens and terraniums to brighten up any indoor space,can also do wall planters like in picture frames. 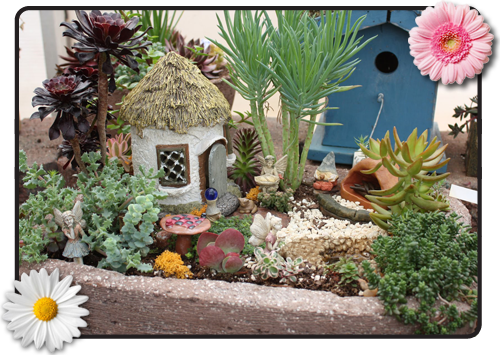 Fairy gardens is the hottest trend at all garden centers,fun and easy to do with all the little trinkets and mini plants,it is so magiacal,whimical and you can let your imagination go to where ever you wish, also helps to teach the little kids to learn how to plant and take care of live plants. 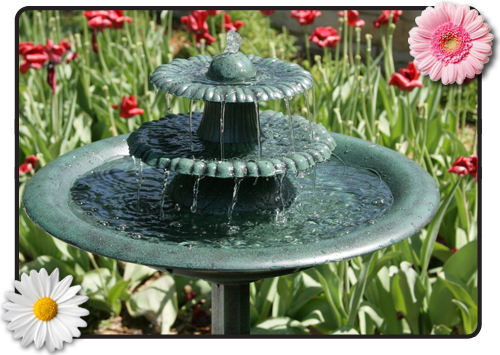 The soothing sound of water will add serenity to any garden space, whether it's a pot on the deck, simple pond, or a large feature in the back yard. 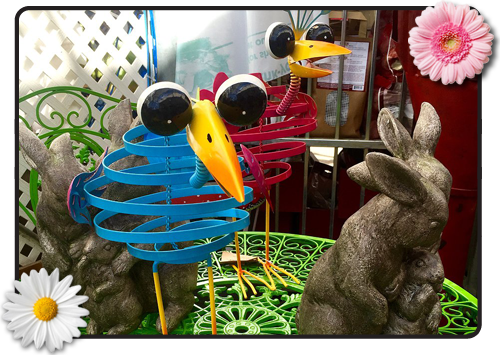 Blondie's carries everything you need to be creative with your water feature. We have a wide selection of water plants - both hardy and tropical - and baskets ready to go. We also have the pre formed ponds and flexible liners in different sizes, as well as the pumps, filters and water treatments to maintain a healthy pond. Finally, take your pond to the next level with a spitter, lights and accessories! 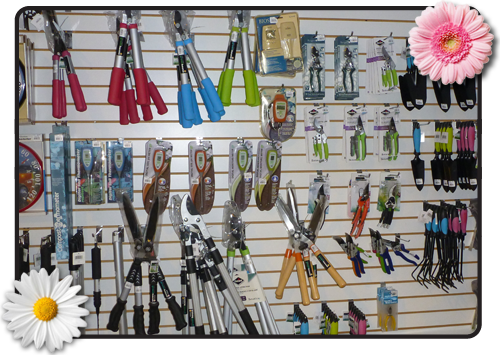 Blondie's carries a wide range of quality garden supplies and tools for your landscaping needs. One of the most important steps is your soil - we have a wide selection of soils and composts to choose from, as well as fertilizers, herbicides and pesticides to keep your plants healthy and viable. 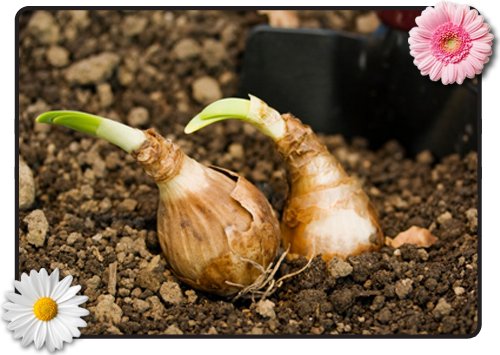 We carry a wide variety of seeds and bulbs for the avid vegetable gardener who prefers to start from scratch. We have a great selection of standard to gourmet seed potatoes, and many types of tomatoes and pepper plants along with a nice assortment of other vegetables and herbs. Thanks for the interest, we are working on this description. Coming soon! Christmas is an especially wonderful time here at Blondie's. We welcome the season warmly and have loads of great decorating suggestions for you as you prepare to celebrate the holidays with friends and family. Think traditional colours of red, green, and gold for your hostess gifts, decorations, and gift wrap. Brightly coloured wooden nutcrackers, dainty mercury glass birds, gold accented ruby red balls, and sparkling silver icicles are a few ideas to begin with. Merry decorations, such as our collection of joyful angels, will elicit a sigh of nostalgia and no-melt snowmen are bound to make you smile! Create a personal touch on your holiday table with a collection of antique ornaments, and look around to further incorporate the style of your home with your decorations. In a southwestern style home, for instance, mixing muted colors with a touch of red and green allows the decorations to complement your surroundings. Casual decorations, like a collection of toy trains or stuffed teddy bears, are a good bet for a rustic family room. Take a playful approach to holiday decorating! When decorating your tree, you can recapture holiday moments from your favourite childhood memories with whimsical decorations that have timeless appeal. Or, you can use different shades and textures of one color and lots of glass to give your tree a sleek new look. Top off your decorations with a sprig of holly to further capture the spell of a winter wonderland and bring the magic of Christmas alive. The traditions we carry with us from year to year in celebration of the Holiday season are as important as the people we share them with. Start some traditions of your own this year that you can share and enjoy. Add the wonderful scent of evergreen to your home! Blondie's offers premium fresh cut Christmas trees, garlands, door swags, wreaths and boughs. Depending on availability, we stock Douglas fir, Balsam fir, Fraser fir, Noble fir and White pine. This fresh greenery will add that special touch to your home this holiday season. Trees vary in size from 2 to 14 feet. 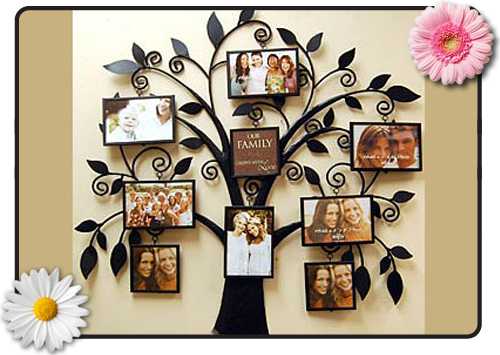 Branches are hinged for fold-away storage, and the tree can be stored with lights attached. They are flame retardant, and a durable stand and storage box are included. Look for pre-lit trees as well, and save time and money this holiday season with a quick set up and LED lights for power savings. Poinsettias are a long time Christmas tradition, but the poinsettia has evolved beyond the simple red leafed plant we have come to know. Today there is many hues - reds and pinks, creams and whites and even some yellows. The bracts have been evolving as well, some varieties even boasting variegated and zygomorphic foliage, which means they have two colors on the leaf and the leaf itself is ruffled. Proper care of your poinsettia includes lots of light and monitoring of moisture. If the soil dries out or water collects in the plastic pot your plant will suffer - it is crucial to keep the soil moist but not soggy, and always discard any excess water that collects in decorative pot covers. You can enjoy your poinsettia all year long with a little attention!